I am a Chicago Resident. It is just so great. I don’t even know what to say. 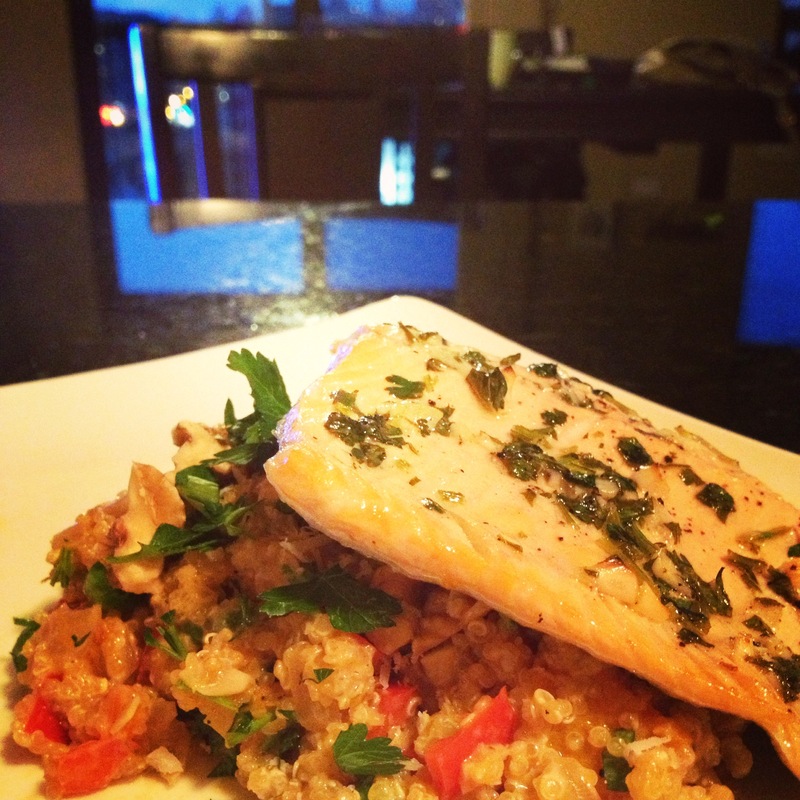 I have no words… other than the ones to follow about Squash, Pea and Goat Cheese Quinoa Risotto with Trout. 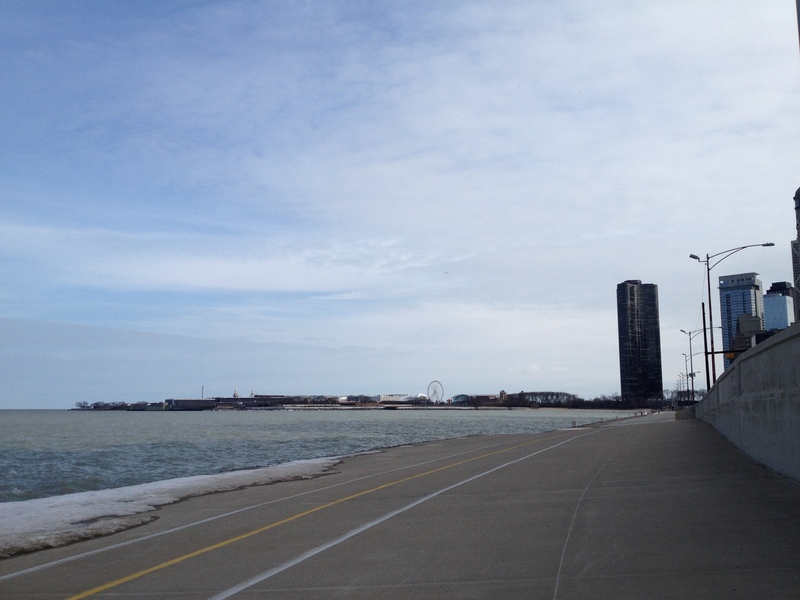 I went for a run on Lake Michigan (OMG this city) and on my way East I stumbled across Fox and Obel. 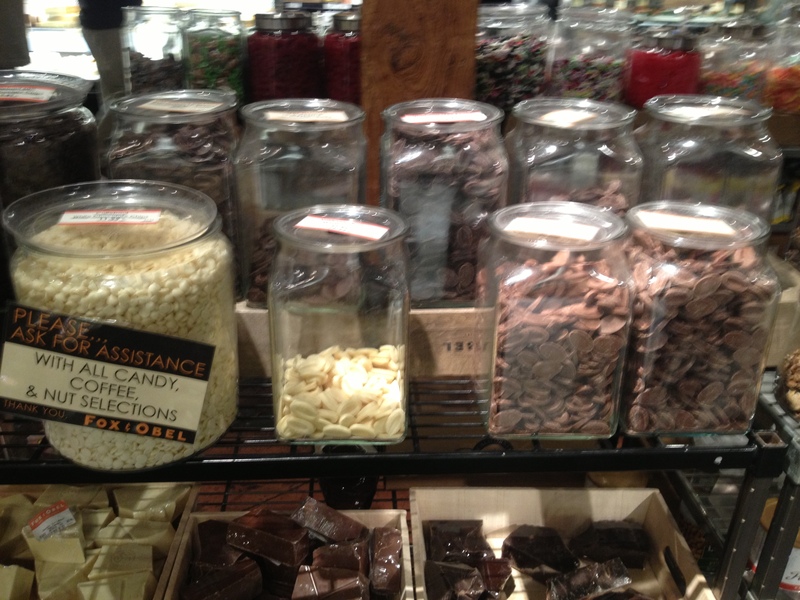 I glanced at it from outside….could vaguely tell there were edible treats inside and kept running. Let’s just say I got about a mile away, reviewed my options and promptly turned around. I entered said food paradise, had a field day and went home and started cooking. 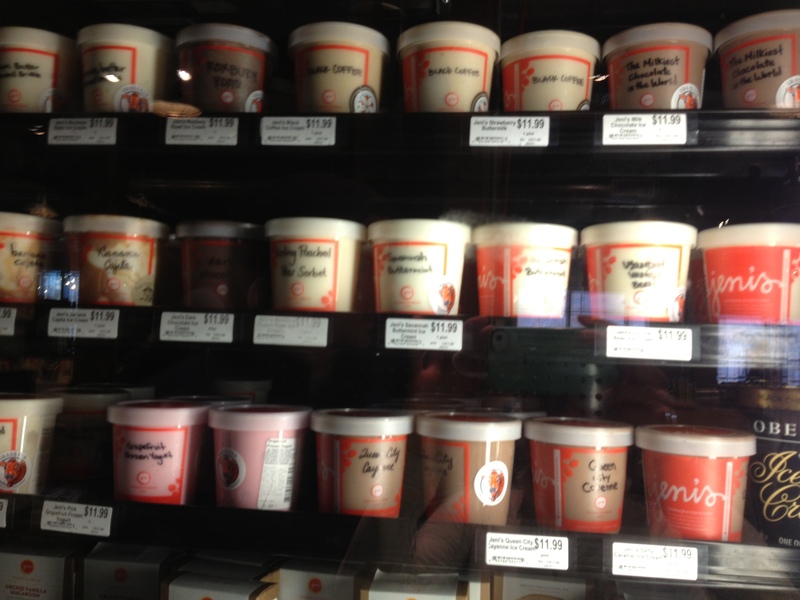 And Jeni’s Ice Cream which deserves a post all to itself! Sidebar: I recently went to Siena Tavern and devoured their amazing farro “side” which tasted risotto-like to me. It was actually so good I am taking my sister there tomorrow for her birthday just so I can eat it again within a 72 hour period. 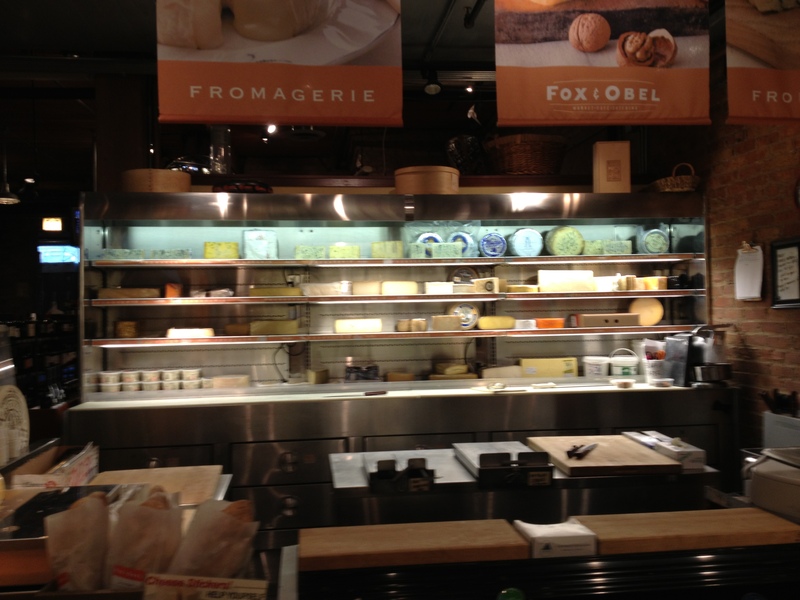 This is where the idea for this dish came from but Fox and Obel did not have farro (not even mad at them for it). Toss the squash with olive oil, salt and pepper and roast at 425 degrees F for 20 minutes (toss occasionally). 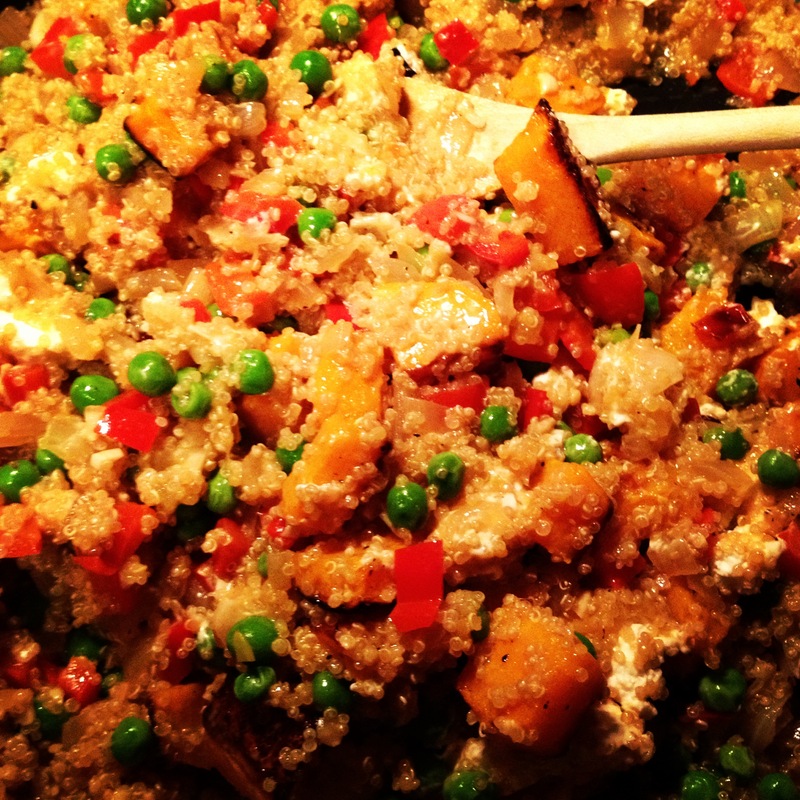 Try not to eat this all before it has a chance to hang in the risotto. Saute the red pepper and onion over medium high heat in two tablespoons of olive oil and half a tablespoon of butter (or just olive oil… I couldn’t not have some butter though) for about eight minutes. It will smell great. While this is happening you want to get your vegetable broth simmering in a sauce pan. 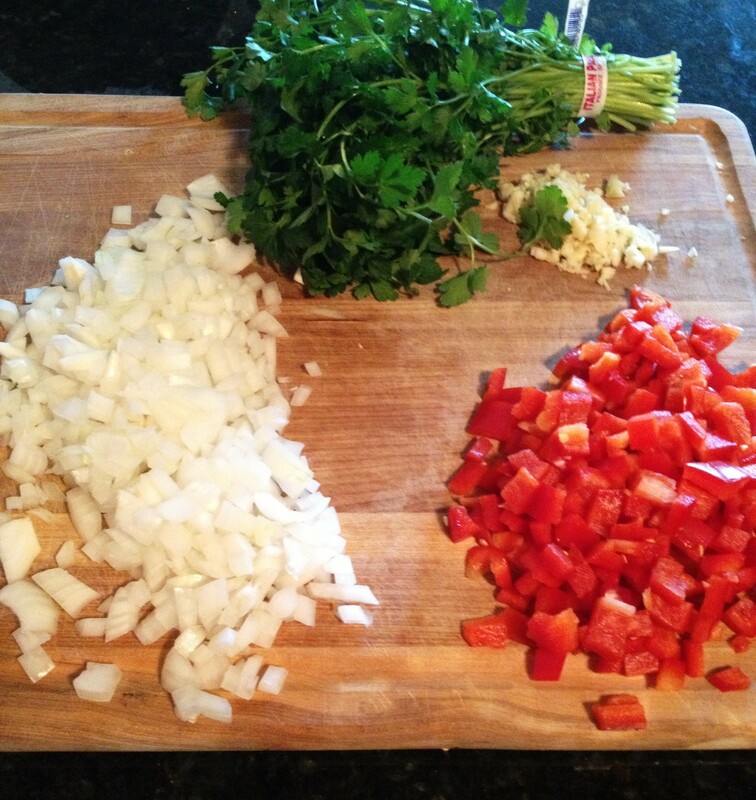 Reduce the heat on your sauté pan to medium and add the garlic. 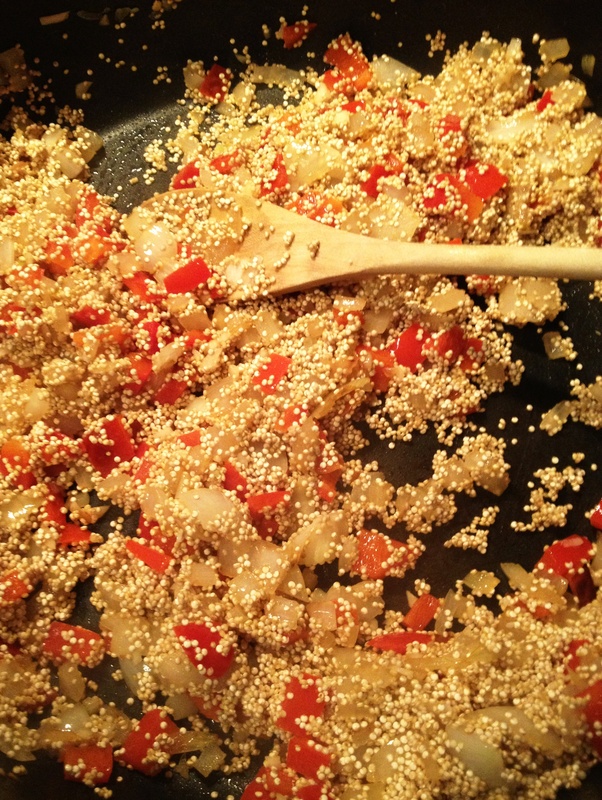 Cook for 30 seconds then add the quinoa. This is that same toasting process we did in the Lemon Risotto. Toast for two minutes then add the white wine, cayenne pepper and sea salt. 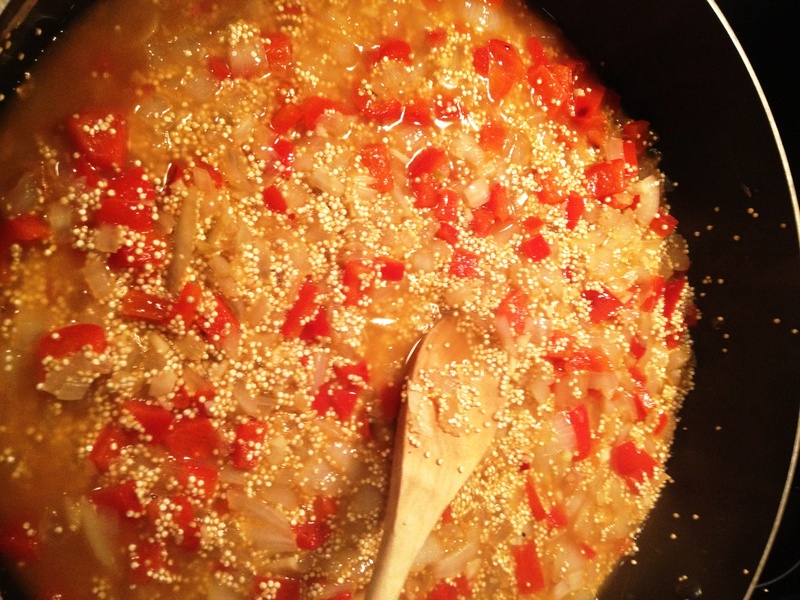 Stir until the wine has just evaporated and then add a good amount of stock (to cover the quinoa). Here is where risotto therapy kicks in. You just stir constantly, adding stock when the risotto looks dry (I do half cup increments) for twenty minutes. I spent this time looking out at the city (did I mention I moved to Chicago?). 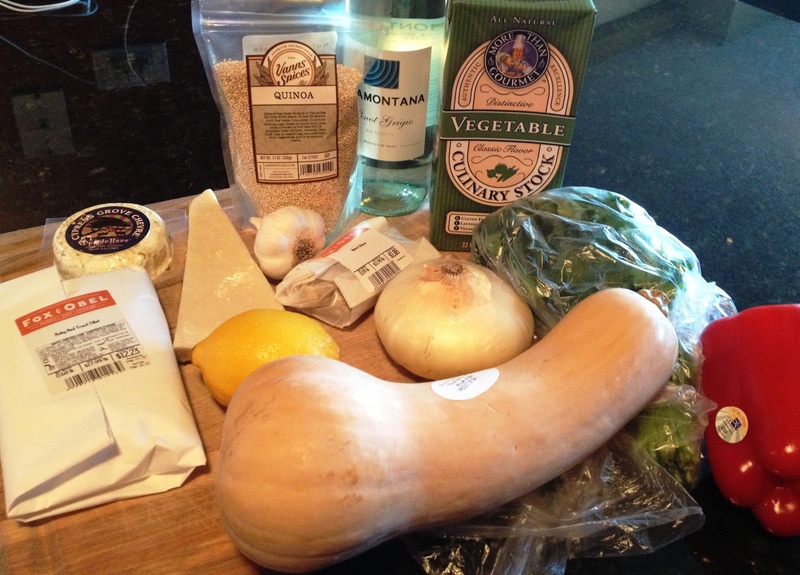 Once the risotto is done add the pecorino, goat cheese, squash, peas, and parsley. Garnish with the walnuts. Serve with the trout (below). This turned out insanely delicious. Brush a baking dish with olive oil. Place the trout fillets in (skin side down). 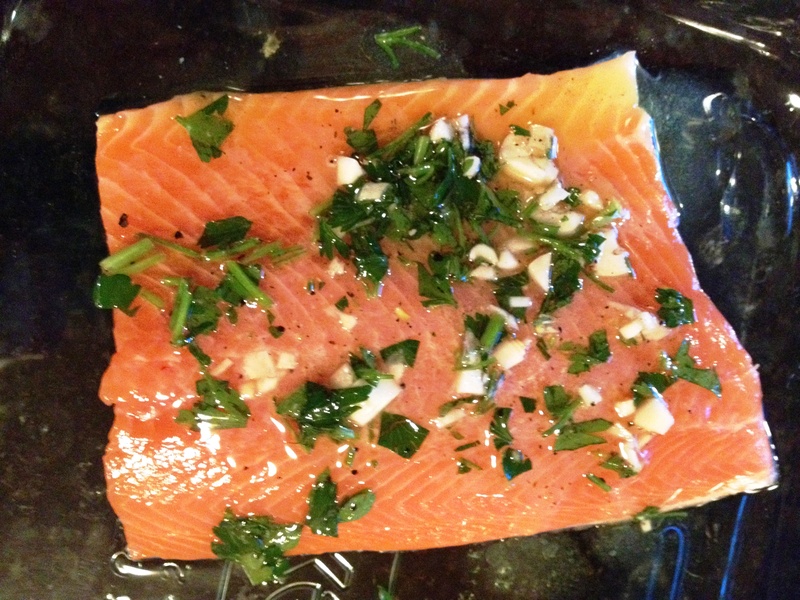 Combine the garlic, lemon juice, olive oil, parsley, salt and pepper. Brush this mixture onto the trout. Broil for five minutes (make sure your oven is on high… mine wasn’t and I had to put it back in… also check for pin bones before you cook the trout or things could get weird). 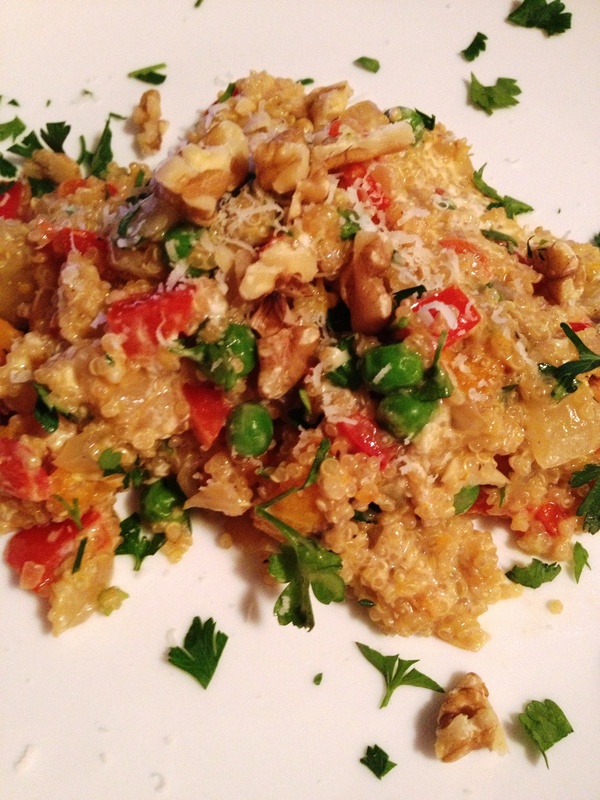 Serve with really delicious risotto. Eat in Chicago.